The Innovators led by LtCol. 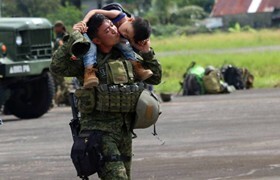 Rizaldo N. Laurena stand at attention as they were accorded a heroes' welcome at Calbayog Airport on July 5, 2018 after two years of deployment in Southern Mindanao, particularly in Jolo and Marawi. CAMP LUKBAN, Catbalogan City – The 8th Infantry (Stormtroopers) Division yesterday, July 5, 2018 welcomed the 63rd Infantry (Innovator) Battalion, one of the Philippine Army’s fightingest units during the Marawi Siege at Calbayog Airport at 12:30 P.M. The Innovators led by Lt. Col. Rizaldo N. Laurena were met with a hero’s welcome by the 8ID Command and General Staff, Local Chief Executive, Chief of Police, Calbayog City, comrades, families, and loved ones upon arrival back in Eastern Visayas on board C-130 planes of the Philippine Air Force. 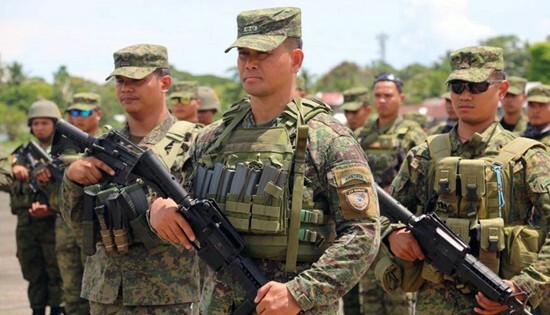 It can be recalled that on August 31, 2016, the Innovators were deployed to Jolo, Sulu to augment the military offensive against the Abu Sayyaf Group and later to Marawi City to help in the fight against the Maute-ISIS extremist group. “Ang inyong pagbabalik ay hindi nagpapahiwatig ng pagtatapos ng gulo sa Mindanao o pagdami ng kalaban sa Silangang Kabisayaan. Ngunit ito ay nangangahulugang, kinakailangan kayo para mas maitupad ng maayos ang ating isinusulong para sa ikabubuti ng mga mamayan ng Samar,” Losañes added.